Daniel Ricciardo has taken the first pole position of his Formula One career with a stunning first-run lap to pip his Mercedes rivals. The Australian set a flawless 1:13.622 around the streets of Monte Carlo, and a last-gasp lap by Nico Rosberg salvaged Mercedes’s afternoon to put one Silver Arrows on the front row, albeit with a buffer of 0.169 seconds. 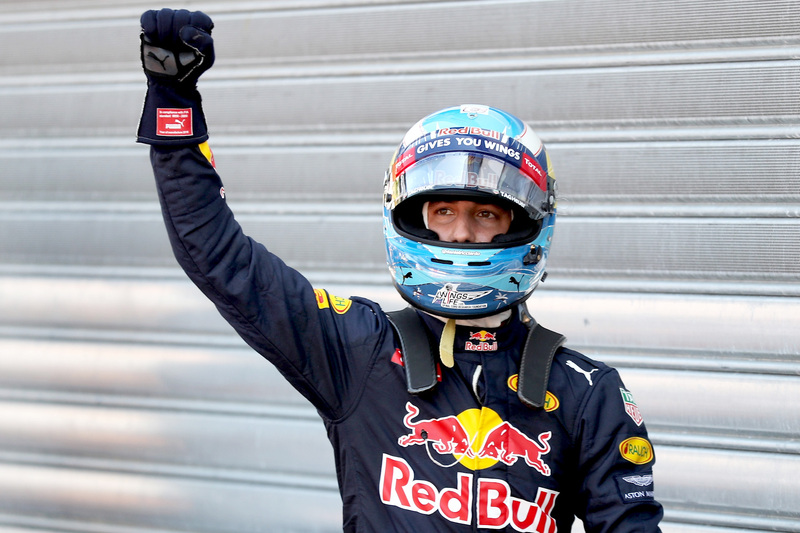 “Definitely a special place [for my first pole],” said Ricciardo. “I knew coming into the weekend we’d have a shot at it, and it looked good from Thursday. “It feels good. I’ve always enjoyed this place. We’ve got a good package behind us now and it’s nice to make the most out of it. Rosberg is aiming for his fourth consecutive Monaco victory to extend his championship lead over what appears to be an increasingly tightening battle behind him. The German, however, was forced to admit Mercedes was never in the frame for pole against a Renault-powered Red Bull package in its sweet spot. Lewis Hamilton had a momentary scare at the beginning of Q3 when he reported a problem with power unit, and he stopped before the exit of pit lane, allowing his team to wheel the W07 back to its garage. Non-executive chairman Niki Lauda told Sky Sports that it had been a fuel pressure issue, which had also affected Rosberg before he was sent out. Both problems were quickly rectified, but Hamilton had time for only an elongated single-run shot at pole. The Briton set three warm-up laps on his ultrasoft tyres before putting the hammer down, and the leaderboard reported that he was about one-tenth quicker than Ricciardo, but the reigning world champion lost something in the vicinity of 0.4 seconds in the final sector, leaving him third fastest. “It was a difficult qualifying, I don’t really know what to say at the moment,” said the despondent Hamilton. “I got out to do a lap at least … so I’m grateful to be up in third. In what will otherwise be a straight fight between the Red Bull RB12 and Mercedes cars, Ricciardo will start the race on a set of supersoft tyres after setting his fastest Q2 lap, allowing him to run a longer opening stint to potential strategic advantage. “We’ll see tomorrow if it works,” said Ricciardo. “The plan was to go out on the ultrasofts n the first run in Q2, then we had time on our side to try to see what the supersoft can do. Sebastian Vettel vented on team radio at the end of Q3 that he could find the sweet spot with his ultrasoft tyres, and the German put his Ferrari all of 0.930 seconds off pole for fourth place. Matter only got worse for the Scuderia when Kimi Räikkönen, who takes a five-place grid penalty for an unscheduled gearbox change, put his car sixth-fastest, with a superb Nico Hülkenberg putting his Force India between the red cars. Carlos Sainz set the seventh-fastest time around a track his year-old Ferrari engine’s power output is negated, leading Sergio Perez and half a second ahead of teammate Daniil Kvyat. Fernando Alonso put McLaren -Honda into Q3 for the second straight race, but could only manage the slowest time of the session. Williams once again failed to impress around the slow-speed corners of Monte Carlo, never looking a prospect for Q3. Valtteri Bottas was beaten by McLaren’s Alonso by 0.2 seconds, but just one further tenth separated him from teammate Felipe Massa in P14. Between the white cars qualified Esteban Gutierrez and Jenson Button, the former outqualifying teammate Romain Grosjean, who will start from P15, for the first time this season. Kevin Magnussen failed to improve his Q3 position, half a second off the pace of the rest of the midfield in P16. Qualifying got off to a fiery start when Felipe Nasr’s Ferrari-powered Sauber failed on the installation lap. The run down to the chicane became spectacularly smoky as the car ground to a disappointing halt, leaving the Brazilian without a time. A red flag was thrown as a crane rescued the stricken Sauber, but the green flag resumption lasted mere minutes before Max Verstappen crashed his Red Bull out of the swimming pool. The Dutchman left too little margin for the right-hand apex, breaking the steering arm and consigning him to passenger status as his RB12 careered into the barriers. After another brief pause for the Monegasque marshals to clean the debris gave way to the rest of qualifying, which left Ericsson’s lone Sauber to fight with both cars from Renault and Manor for a Q2 berth. He was unsuccessful by a painful 0.04 seconds to Kevin Magnussen, whose Renault is equipped with an upgraded power unit in Monaco, completing a miserable Saturday for the Swiss team. Jolyon Palmer had an opportunity to pip his teammate for the second session, but a lock up at the first turn on what should have been his final flying lap sealed his fate, which was to start ahead of Rio Haryanto and Pascal Wehrlein on tomorrow’s grid.